I was told I would miss my pregnant belly once it's gone, and at the time I thought this was crazy talk. I was told this at 38 weeks pregnant when I was at the height of my discomfort, so I found this hard to imagine. Now, 3 weeks later, I find what I thought was crazy talk wasn't so crazy after all. I was lucky to have a very smooth pregnancy. I mean nothing went wrong; Hudson never even jabbed me in ribs, so it's easy for me to mourn the loss of my belly. There is something special about being pregnant. 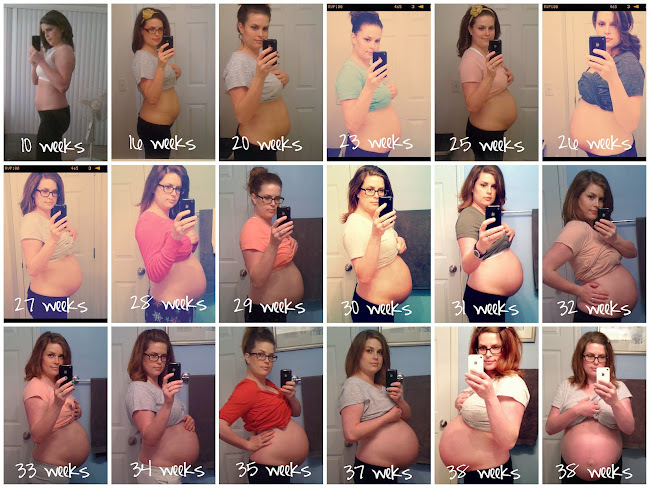 Here is just one last look at the my pregnant belly and how it grew over the 9 months or so of my pregnancy. Now I will not mourn the loss of the post pregnant belly that's sticking around. Found your blog through Instagram. Beautiful. Isn't it amazing to see how much your body changes in just one week. I'm amazed by 34-35! I'll admit, even after having 2 and getting my tubes tied and KNOWING I'll never be pregnant again, I STILL miss my pregnant belly. I loved being pregnant. The whole experience is special and wonderous. then to hold you first baby after all that time is no less than a miracle.